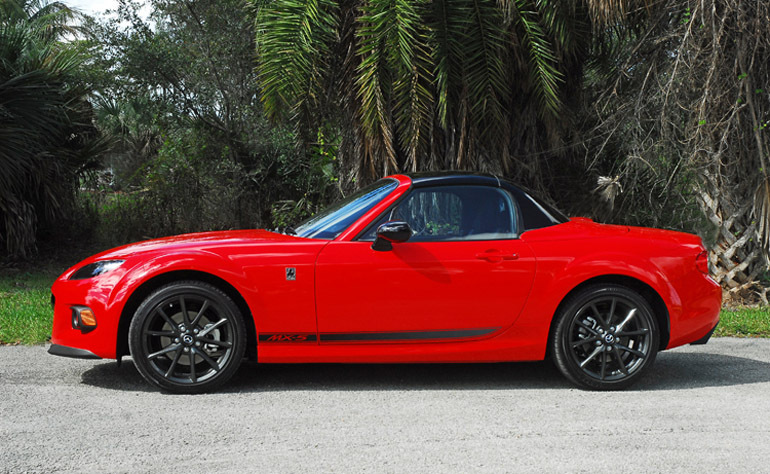 When I say ‘cheap thrills’ I mean that I can’t find any other two-seat pure sports roadster for under $30,000.00 that gives so much sports car thrills and driving pleasure with a power-retracting hardtop. 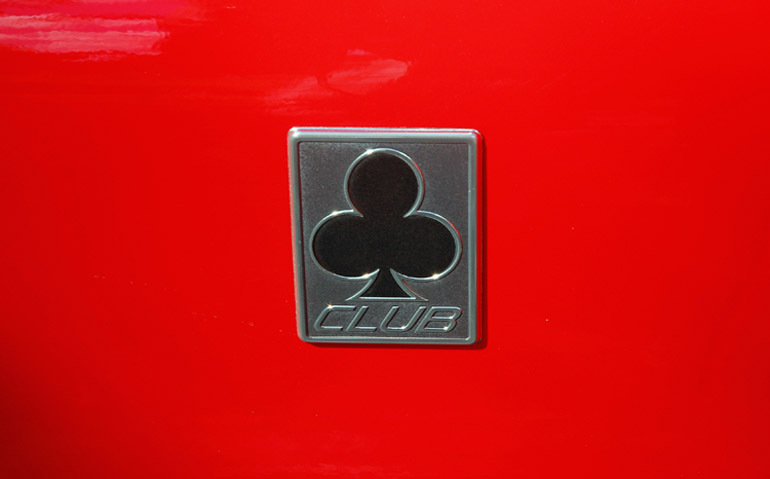 I just finished testing and photographing the new Club model and it is a real ‘kick-in-the-pants’. 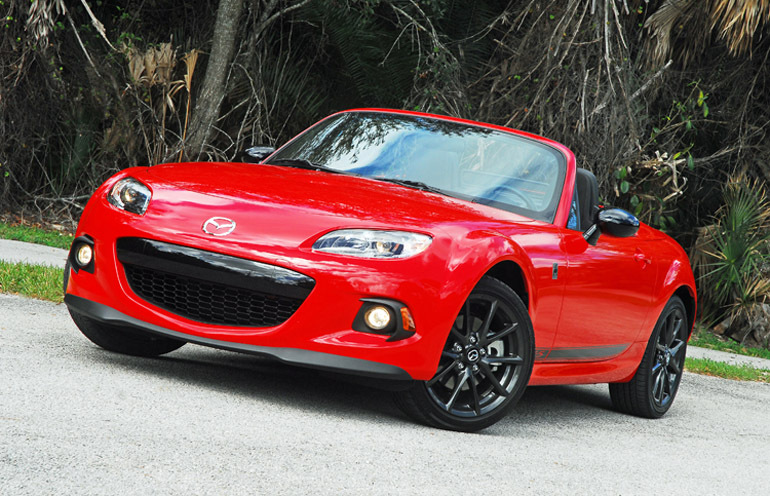 For a pure two-seat sports car the 2014 Mazda MX-5 Miata ‘Club’ has it all. The Club model that I tested has styling that is pure with a wide-mouth front grille finished with a piano black upper brow, black splitter with a flat underside, an aluminum hood, projector-beam headlamp clusters with black bezels, new projector-beam foglamps with black matte surrounds, flared fenders stuffed with 17X7 inch dark gunmetal alloy wheels wrapped with Bridgestone 205/45R17 inch street-sticky Potenza RE050A low-profile performance tires, body-color pull-out door handles, black power-remote outside mirrors, black ‘MX-5’ lower strip, a ‘Club’ medallion on each fender, seat back bar garnish is displayed in a glossy dark gray motif, rear diffuser and finished with dual sport-tuned, polished stainless steel exhaust tips. 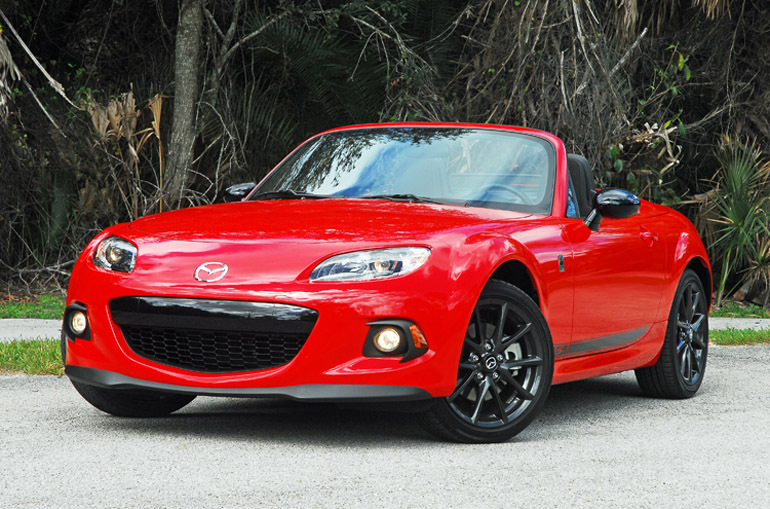 The power hard-top is painted in glossy black to give the body a bolder look. The power hard-top just takes 15-seconds to raise or lower and I just have to release the center lock on the inside and push a lighted button. Power and performance easily back up the bold looks starting with the high-revving (7,200rpm redline), MZR 2.0 liter, all-aluminum, DOHC, four-cylinder engine with VVT for excellent low-end torque. It generates a healthy 167hp at 7,000rpm and 140lb.ft. of torque at 5,000rpm. I tested the engine mated to the six-speed, short-throw manual transmission that comes with an Induction Sound Enhancer that consists of a series of tuned pipes and a passive resonance membrane. It delivers the engine’s natural induction sound to the cowl, just ahead of the windshield, so more attractive engine sounds can be heard at a satisfying volume without resorting to simply being a loud, obtrusive noise. 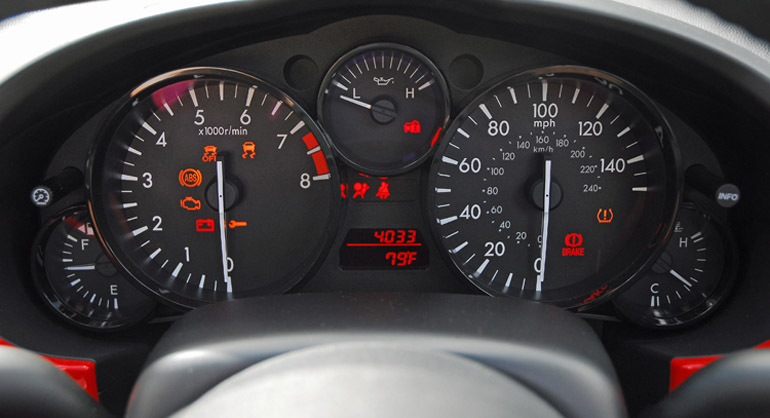 Mounted front mid-ship for precise handling and balance, additional engine features include a forged steel crankcase, forged steel connecting rods with floating wrist pins, and revised pistons with stronger wrist pin bosses, stiffer valve springs and engine oil cooler when exercising the MX-5 for long periods of time on the backroads. The stubby, leather-wrapped, short-throw six-speed manual that was mated to my test MX-5 was perfectly placed and a pleasure to use. Each time I changed gears to the next I felt a push to my back, the harder I pushed on the throttle, the more the push back into my seatback. 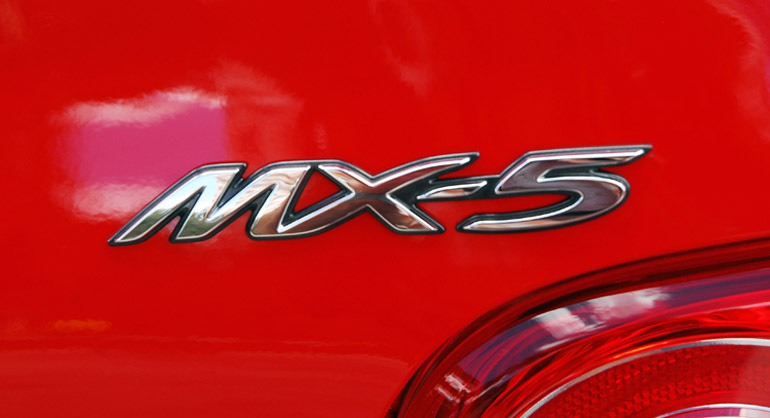 The MX-5 also comes standard with aluminum Power Plant Frame for exceptional stiffness and weight saving, plus a limited-slip differential to put the power down to the pavement. The MX-5 ‘Club’ comes standard with a sport-tuned fully independent suspension for precise handling when cornering and a solid feel when driving at triple-digits on the highway. 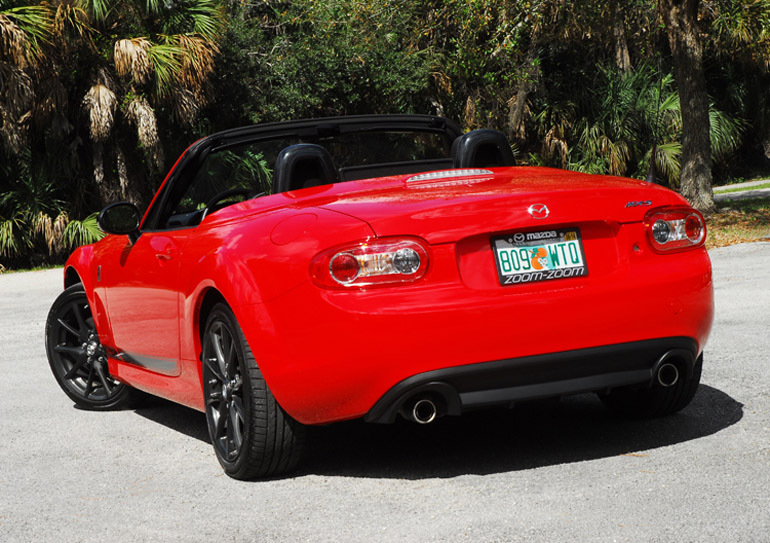 Even though the weight is only 2,511 pounds the MX-5 feels like it is riding on wheels. Up front is a double-wishbone setup with forged aluminum arms, coil springs, monotube gas-filled Bilstein shocks and a stabilizer bar. The rear features a multi-link setup with an aluminum baring support, monotube gas-filled Bilstein shocks, coil springs, tubular control arms, an aluminum knuckle and a stabilizer bar. For added stiffness and control the MX-5 comes standard with front/rear subframes, a monocoque unibody with a backbone frame construction. These items further eliminated any noise, vibration and harshness when driving. Away we go with a perfectly calibrated electronic power-assisted rack & pinion -steering system that moves the MX-5 exactly where I want the car to head-just a little tug on the leather-wrapped/tilting steering wheel moves its direction with precision. 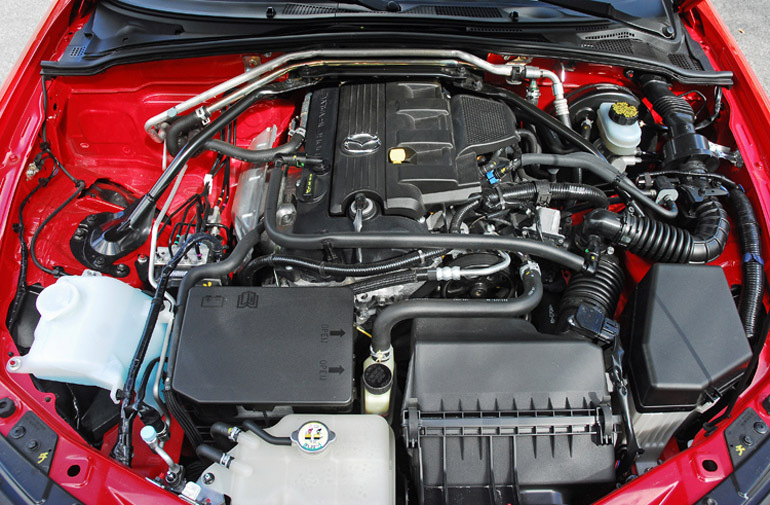 A front strut tower brace further adds to the stiffness and cornering prowess. On-center feel and my feel for the road are exceptional. This system is just perfect for the MX-5 to keep it up-to-date and pure. 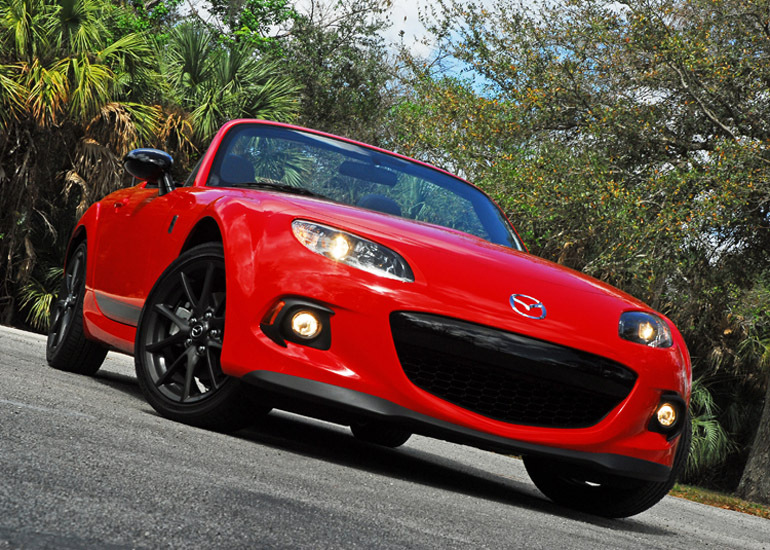 Quickly and safely slowing the MX-5 ‘Club’ down from speed are power-assisted, steel disc brakes. Up front are 11.4 inch vented discs clamped with large single-piston aluminum-housed calipers with the rear equipped with 11 inch solid discs clamped with single-piston aluminum-housed calipers. Standard brake enhancements include ABS, EBD, Dynamic Stability Control and Traction Control. For real pulse-quickening times I shut off the Stability/Traction Control system off to let rear slid out when exiting a steep corner. On the inside the ‘Club’ theme continues with a body-color-matching decoration panel feature trim-specific graphics, red contrast stitching on the deeply cut yet comfortable cloth bucket seats with manual adjustments and driver’s-side height adjuster, a dark gray contoured surround meter around the stunning gauges, A/C, power express down windows, power door locks, cruise control and AM-FM-CD-MP3-WMA-Sirius radio controls on the steering wheel, rear center console storage, storage baskets at the bottom of each door, mesh aero board, center console with dual cupholders and storage bin, front open storage tray, map light, dual vanity mirrors, auxiliary audio input jack, remote keyless entry, trip computer and floor mats. All buttons, switches and dials are easy to reach and fully illuminated for safe nighttime travel. Standard safety systems include 3-point safety belts with pretensioners/load limiters, advanced dual front and side airbags, front/rear crumple zones, anti-theft engine immobilizer and side-impact door beams. 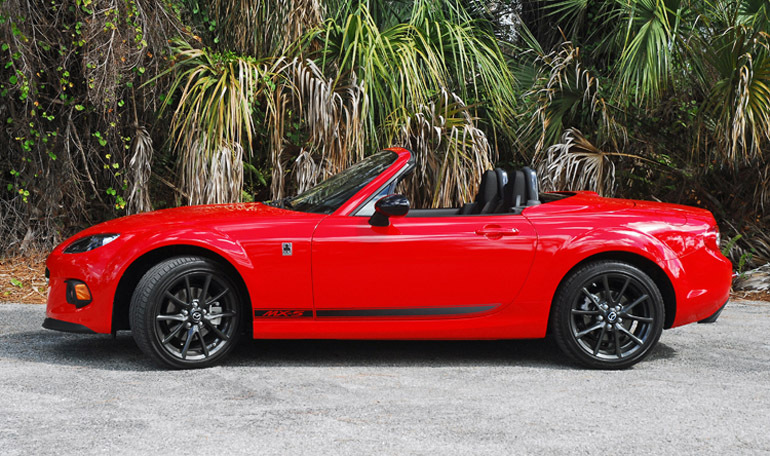 The new 2014 Mazda MX-5 Club Hardtop Convertible is one of the best values in two-seat sport roadsters. More than 900,000 consumers have purchased the MX-5 so far and the owners that I spoke to raved about the fun-to-drive elements. I would recommend that consumers over 6ft. 3in. get inside first with the top up before a purchase because I had only ½ inch of headroom and I am 6ft. 3in. Other than that its ZOOM-ZOOM fun!